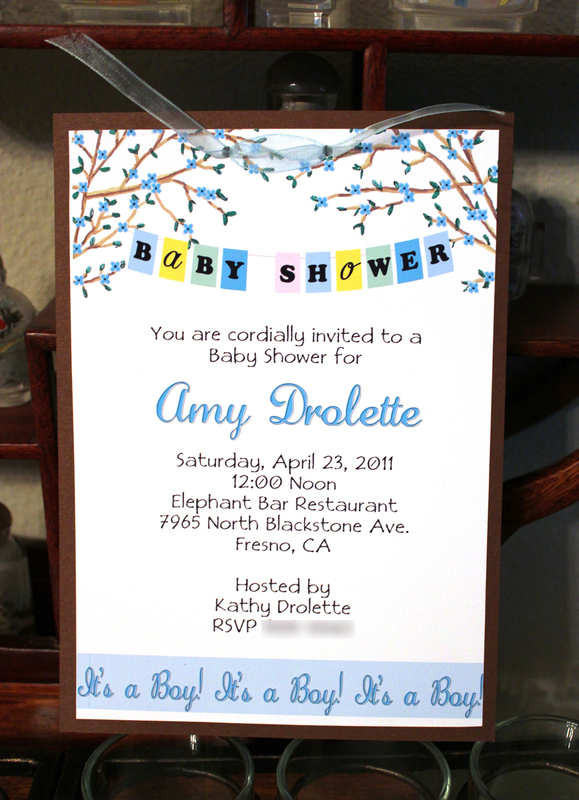 And this is what I came up with for Amy’s baby shower. I hand drew the branches and leaves with colored marking pens and scanned that into the computer in opened in Photoshop. Then I created a brush to make the blue flowers on the branches, put in the text and printed. I cut the card invitation out and placed it on a brown cardstock and finished off with a ribbon. I think it needs a darker ribbon though. This entry was posted on Saturday, March 26th, 2011 at 9:37 pm and is filed under Uncategorized. You can follow any responses to this entry through the RSS 2.0 feed. You can leave a response, or trackback from your own site. very cute Invitation!!! Yes you need a darker blue ribbon or even a yellow or pink would look nice! Maybe yellow instead of pink…you always do such cute things.